Step inside the Bressi Ranch office of The Lund Team and you soon realize that optimism is contagious. Founder Carlton Lund’s perseverance is legendary. 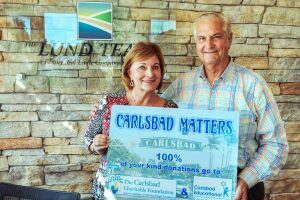 A former Chairman of the Chamber and 2007 Carlsbad Citizen of the Year with his wife Sandy, Carlton was an early champion of the once-controversial LEGOLAND California Resort project in the face of significant opposition. He later led a crusade to resurrect the historic Carlsbad sign in the Village, creating arguably the most recognizable landmark in the city. 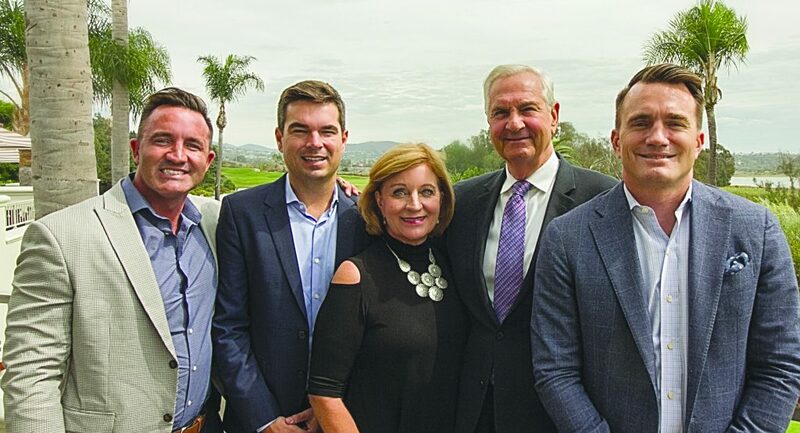 After building their real estate firm for over 37 years, Sandy and Carlton are gradually transitioning management to their sons Garrett and Tyson along with a 20 year veteran of the firm, Jeff Pashby. With energy matching his father’s, Tyson speaks to one of the reasons for the firm’s success. “A home is such a large purchase so people are naturally fearful but we help them realize that challenges can be overcome. Dad makes an emotional connection with people. His enthusiasm is contagious” he says. Garrett and Tyson have real estate in their blood. The Carlsbad natives grew up in numerous homes that their parents would fix and flip. “We grew up with talk of real estate at dinner and sitting in the car while my parents would drop off an offer” recalls Tyson. Thriving for so long and remaining independent from a national brokerage, the Lund Team sets themselves apart from the competition by their deep experience and level of service. “We’re in the trust business. 60% of our business is from past clientele. A satisfied client is the most important weapon to protect your business. We have some customers that are the third generation of clients of the firm” says Tyson. The firm will send two associates to meet clients for a potential listing and may take 60 days to prepare for a successful launch. They see great value in an open house by allowing the agent to make a personal connection and talk about the experience of living in that neighborhood. Carlton and his sons also have extensive personal experience investing in houses and land that they can draw upon to advise clients that may be looking to do the same. The brothers do not feel a threat from internet-based realtors and instead welcome the interest in real estate generated by such sites and networks like HGTV. While some purchasers simply want someone to “open a door” for them, most want the counsel of an experienced advisor. However they do observe that self-fulfilling prophecy play out in the perception of the role of agents when they work through internet-based realtors. “To scale so large they need to hire less experienced agents. Clients may get a lower level of service and therefore think the agent isn’t an important part of the transaction” says Garrett. Tyson notes “Many go into real estate after failing at other businesses. It is difficult because you are trying to add value to an equation and it takes years of experience to add that value.” He advises someone interested in a career as an agent to ensure they work alongside people they can learn from and be committed to the long haul it takes to be successful. After building their real estate firm for over 37 years, Sandy and Carlton are gradually transitioning management to their sons Garrett and Tyson. 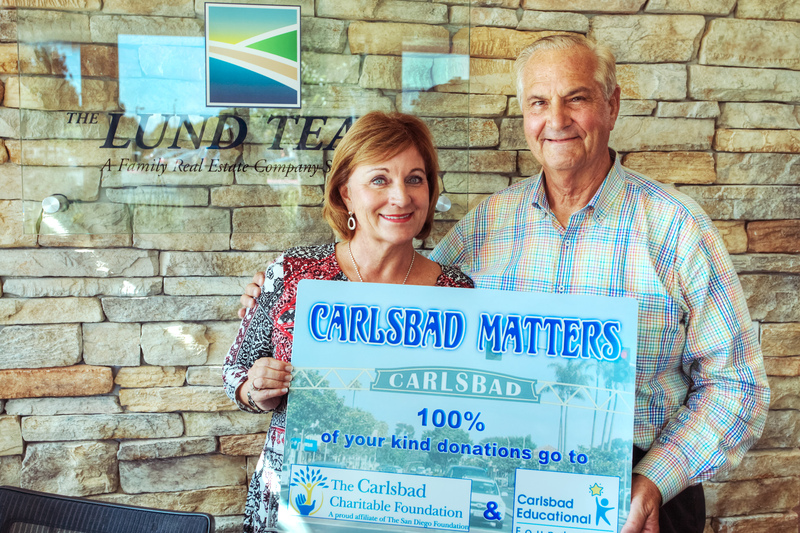 All three see nothing but positive trends in the value of living in Carlsbad. They point out the increasing number of people telecommuting rather than living in more expensive cities like the Bay Area, New York or Los Angeles. 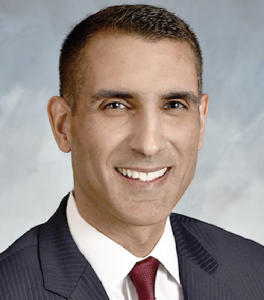 Although each studied at Arizona State University and Carlton’s employer tried to transfer him to his native Wisconsin (“The shortest conversation I ever had” he remembers), they appreciate the health and wellness benefits, the positive attitude and entrepreneurial culture of Carlsbad and note the area is still priced competitively with alternative areas of California. Asked about policy changes they would like to see in Carlsbad, Garrett points out ordinance changes in neighboring areas easing the construction of multiple structures to house aging family members or serve as rental property. Carlton believes the area does not need more large homes but instead more multifamily properties like townhouses. All three, longtime residents themselves, balance the need for additional housing with a desire to preserve the character of the area that they value.